This Sundale Outdoor 55 lbs Heavy Duty Patio Umbrella Stand Concrete Umbrella Base with wheels ensures that your patio umbrella will remain securely intact with style and practicality. The unit's screw mechanism keeps any sized umbrella pole securely attached to the base even in a windy condition ensuring stable use. With a highly attractive finish, this piece adds charm and elegance to backyard, garden or any patio space. This base is fade, mildew, water, UV, weather and stain resistant that makes it look like new for a long time. Place one under your dining set to provide a shady and relaxing outdoor dining experience with your favorite outdoor umbrella. - Item Weight: 55 lbs. - Gross Weight: 57.3 lbs. Umbrella Base Tube can fit 1 3/8", 1 1/2", 1 8/9" umbrella poles. 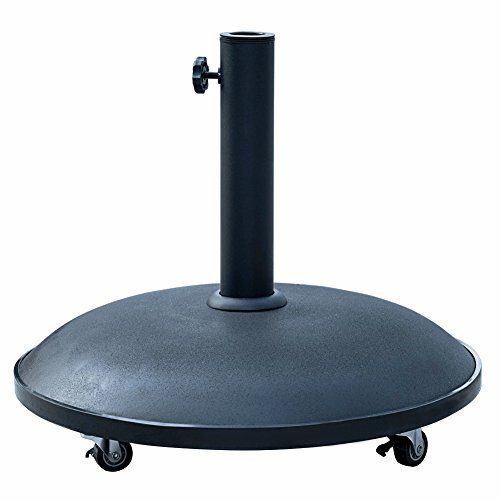 4 wheels make it possible to move your umbrella much more easily, stop the base anywhere with brakes on wheels. Umbrella base is constructed from solid concrete material for years of use. Features a tightening knob for securing umbrella to the base, preventing chipping, peeling, rust and corrosion. Brings nature and beauty into your garden, backyard or any patio space. If you have any questions about this product by Sundale Outdoor, contact us by completing and submitting the form below. If you are looking for a specif part number, please include it with your message.